ST aims to provide robots that are affordable, easy to set up and use and easily programmed by any individual regardless of experience. We provide free and unlimited support throughout the learning curve. We equally aim to provide a low cost solution to experienced users for a diverse range of advanced or complex tasks. Some users manage with our acclaimed manuals, some need more support and advice. It's what we do. We spoke with you in 2014 when you spoke about the company and markets served. In the 4 years since, the Robotics industry has seen rapid growth and change. Tell us about ST Robotics now and how the company has evolved. Where have you seen the most growth in the company the last few years? 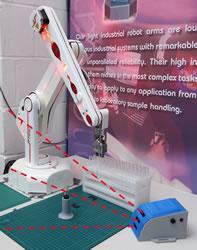 What is it that you feel sets ST Robotics products apart from others? We have always believed in the "boxed robot" concept. Unpack it, set it up and go. Simplicity equals reliability so we keep them simple. The simplicity also results in ease of use. Users with no technical background at all can get going with our software in which the user has a kind of conversation with the robot. In fact we even had a speech input facility so the robot literally does what it is told! Then we follow up with unlimited free technical support. You are currently seeking distributors for your product, tell us about that. Although we are mostly Internet based there are many customers who prefer to contact a local distributor. This is especially true if they want the system installed along with other equipment so we have found integrators to be very useful. We are seeking distributors and integrators around the world and not just the USA. Where do you see ST Robotics and Robotics in general 5 or 10 years down the road? We see a few serious growth markets in agriculture. We are currently collaborating with some companies who will access this huge market by licensing our technology. Simplicity and reliability are essential in this field. We are also collaborating with universities to bring more innovation ideas into the company. In 5-10 years ST will still be selling low cost robots along with its extensive range of accessories but also heavily involved in new markets such as agriculture, vending and many other specialized applications.